The preceding article was published in the March 1947 Issue of the London Trustee Savings Bank Magazine. The following is a transcription of the article. No one would suppose when Mr. Brittain walks into the Board Room with vigorous steps, his eye not dim nor his natural force abated, that he was born on December 31st, 1861. Eighty-five years leave no outward mark upon him, even when (to the delight of us all), he was married again last year, he appeared with a flower in his button-hole and a cheerfulness of countenance that would be appropriate to the youngest among us. He is the kind of man who by sheer force of character always comes to the top. There is a benevolent serenity of disposition about him which invites friendship and confidence. But a genial disposition only emphasises hidden strength. He is a man of experience, of decision, and of action. His Yea is Yea and his Nay Nay. Though a man of few words , when he does speak he has the gift of lucid expression and penetrating wisdom. His is the last word. It is an honour to such a man to say he is self-made. Born only two miles from Bunyan’s home at Elstow, he belongs to a Methodist family of the third generation. At fifteen he went to London to work in the well-known Lambeth building firm of Hill, Higgs and Hill; after another fifteen years he set up on his own in Kennington. There the firm of George Brittain and Sons still flourishes. Possessed of great natural ability, incorrigible integrity, and charm of person, of course he has gone to the top in everything he has touched. Beginning his municipal life in 1898 as a candidate for the old Lambeth Vestry, he straightaway headed the poll. In 1900 he became a councillor on the creation of the first Lambeth Borough Council. By 1919 he was Mayor and an Alderman. Other honours came rapidly. In 1915 he was made a J.P., and was Chairman of the Assessment Committee for fifteen years continuously. In 1936 he suffered his one setback. A new party came into power on the Borough Council, and in a weak moment appropriated all the aldermanships to itself. On the Metropolitan Asylums Board Mr Brittain rose to be Vice-Chairman; and for many years he served on the Executive Committee of the London Master Builders’ Association. In politics he is by heredity a keen Liberal, and his London headquarters are the National Liberal club, where in 1939 he was entertained by a large non-party gathering on retirement from political life. Equally loyal to his Methodist heritage, he has held every office in the Methodist Church open to a layman. Having been a class leader and a Sunday School treasurer he is still a local preacher and a member of the Conference. 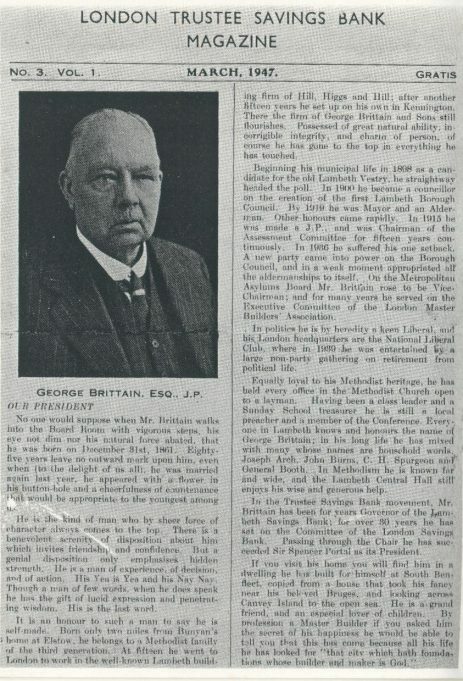 Everyone in Lambeth knows and honours the name of George Brittain; in his long life he has mixed with many whose names are household words, Joseph Arch, John Burns, C.H. Spurgeon and General Booth. In Methodism he is known far and wide, and the Lambeth Central Hall still enjoys his wise and generous help. 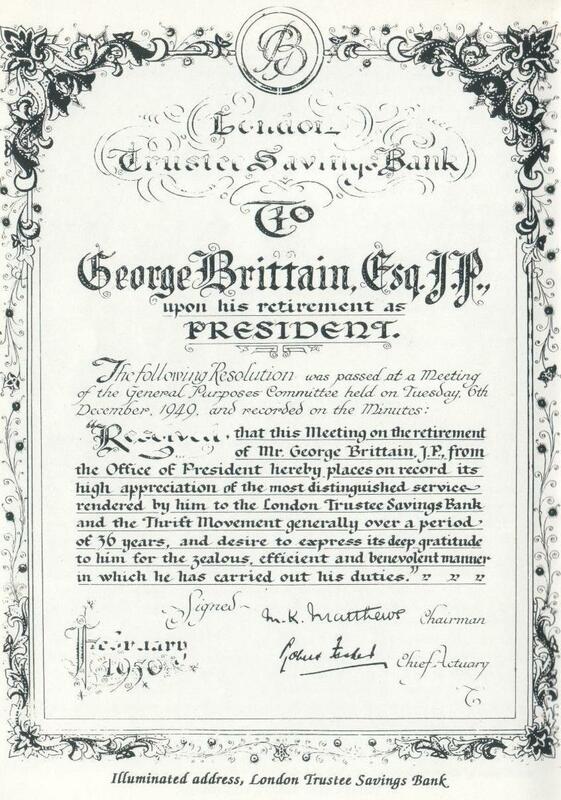 In the Trustee Savings Bank movement, Mr. Brittain has been for years Governor of the Lambeth Savings Bank; for over 30 years he has sat on the Committee of the London Savings Bank. Passing through the Chair he has succeeded Sir Spencer Portal as its President.